I am accustomed to being among the oldest diners in many DC restaurants. Most of the time I don’t really think about it- except when I am standing in line to get into a place like Toki Underground and my back starts killing me after 10 minutes. But walking into Wildwood Kitchen, the new Robert Wiedmaier retaurant in Bethesda’s Wildwood Shopping Center, is a different story. My first clue that I may be on the younger side of the demographic scale is the Bobby Darin tune playing in the background. It’s actually refreshing to be in a restaurant that has me in the lower age range of its target audience. Wiedmaier’s reputation precedes him, as the chef/owner of notable restaurants including Brasserie Beck and Marcel’s, as well as Bethesda proper’s Mussel Bar (which I can’t seem to get motivated to try, since I don’t eat mussels). In this suburban strip mall, he is clearly aiming to fill a niche in an area that is high in income and low in decent restaurants. I arrive early and this gives me a few moments to soak in the atmosphere. Wildwood Kitchen is casually elegant, with a touch of the outdoors brought indoors. This includes a border with a forest scene, and a light fixture that looks like a tree branch. Everything is kind of wild and woodsy. I can’t quite decide what to make of the servers who are attired in checked shirts and jeans. On the one hand, it goes with the theme, but the Mediterranean-influenced menu feels more dressed-up to me. The menu itself is short and appealing. Part of the concept is that the food is light on butter and cream, perfect for the largely over-50 suburban crowd, who are likely to applaud flavor without the added calories. I put myself right into this category. It’s refreshing to know that I can dine with a bit less concern for the long-term impact. There is a special menu for Valentine’s Day. I am relieved to find that the regular menu is also available, since the special entrees are all priced $20 higher than the standard ones. This irks me. It would be so much more endearing to find a price fixe special menu offering discounts, rather than inflated pricing. It doesn’t take me long to recover. Wildwood Kitchen wins me over once they deliver a crusty bread with tuna ganoush dip. Think baba ganoush but with a mild tuna flavor to add interest. 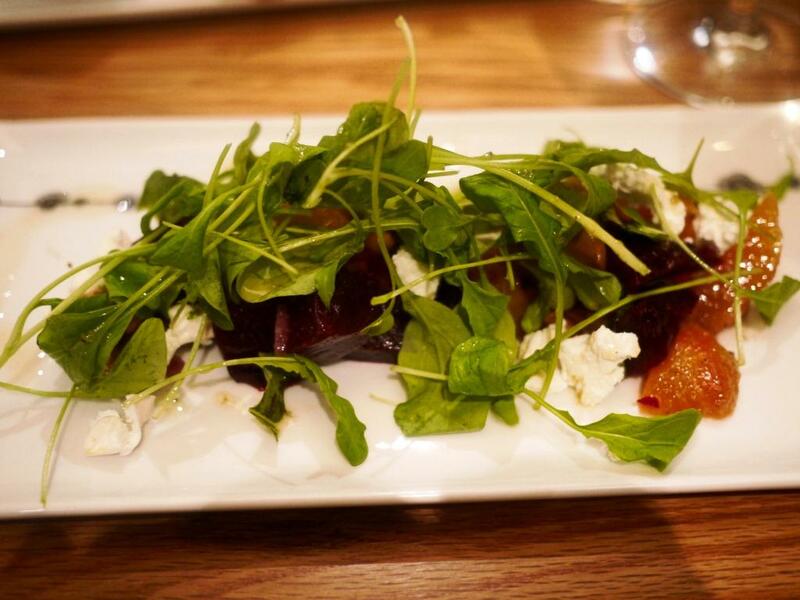 My husband and I share a beet and goat cheese salad. I confess that I am beginning to tire of this standard starter, which I find myself ordering all too often. But this is a high quality version, and I particularly like the soft and creamy goat cheese. My main course is roasted duck breast with Tuscan style cauliflower, date puree, and cherry duck jus. I could not have picked an entree better suited to my taste. 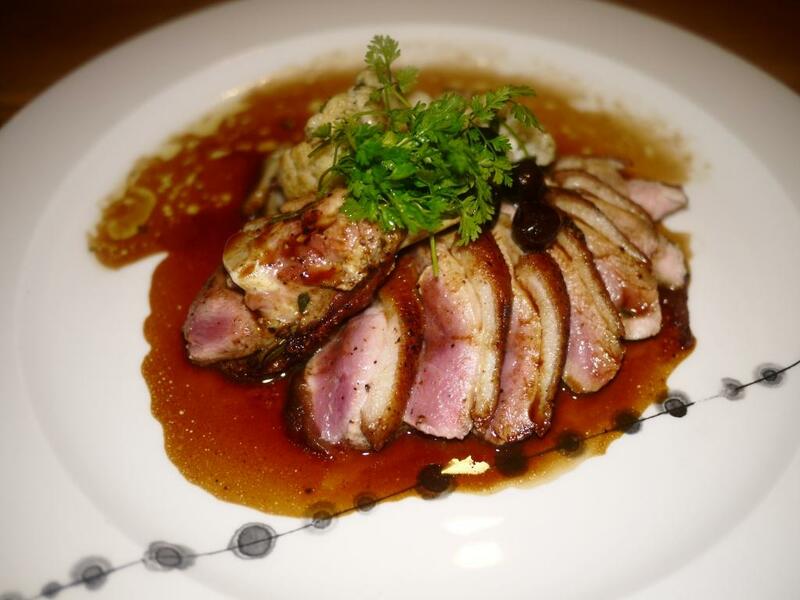 The duck is perfectly cooked with a lightly crisped skin, and a sweet but not too sweet sauce. Dare I say, I nearly licked my plate clean? 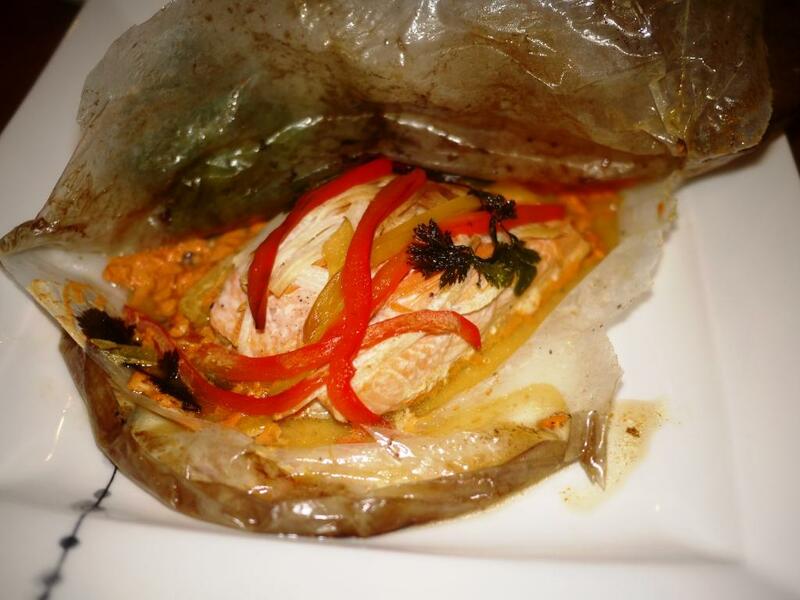 My husband is equally fond of arctic char en papillote with julienned vegetables, lemon, coriander, and carrot jus. This is a package that is particularly fun to unwrap, unveiling a moist and fragrant fish. The dessert choices are limited and nothing really speaks to me. But it’s Valentine’s Day and a shared dessert feels like a must. 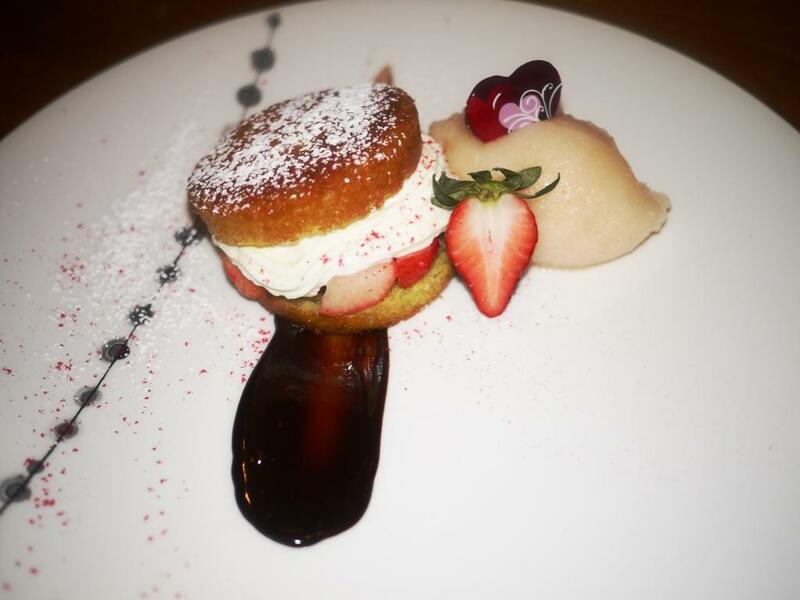 We order the olive oil shortcake with champagne sorbet and strawberries from the special Valentine’s Day menu. At $12 it’s going to be difficult to live up to the price. The shortcake doesn’t have much flavor, but we like the champagne sorbet. Worth it? Not really. The service here is competent- staff are not overbearing but at-the-ready when needed. This is important at a suburban restaurant where some patrons will consider good service to be more important than good food. Fortunately, Wildwood Kitchen offers both. Some of the newer additions to the Bethesda/Rockville/Potomac dining scene such as Founding Farmers, Matchbox Rockville, Chef Geoff’s Rockville, and Sugo Cichetti are fine options as companions to a movie or theater, or even for a girl’s night out. But there are only a handful of Montgomery County restaurants that I consider worthwhile, if a decent dining experience is the primary intent of the evening. Wildwood Kitchen is now on my list. The fact that I can act my age makes it all the more appealing.